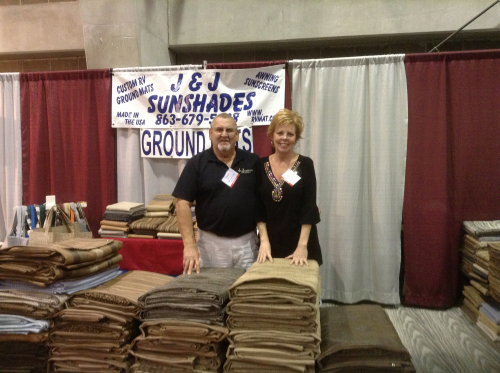 J & J Sunshades was founded in 1992, and was owned and operated by the same family for 15 years. In 2007, Tina Hayes purchased the business, and today it is still a family owned and operated business. We intend to have the same quality and service as in the past. We live in Lake Wales, Florida where we have a small shop and do all of our own sewing. We hope to see all of our RV friends at the various shows and rallies. Our shop hours are 9:00 am to 4:00 pm EST, Monday through Friday. We look forward to seeing you soon. You can see us at Good Sam Rallies, the Harrisburg RV Show, the Tampa Supershow, Newmar, Holiday Rambler, Sunnybrook and FMCA. And we are always adding more. We continually strive to maintain our reputation for 100% customer satisfaction, promptness of our shipments and the highest quality in our mats and sunshades !